This is the first of two articles for Sunshine Week, an annual event which promotes open government and freedom of information (read the second one here). FOIA is a valuable tool that anyone who opposes government corruption and abuse should be using to help uncover the misdeeds of public officials. Be warned though, it’s not cheap, and agencies love trying to inflate the cost to dissuade people from getting information. In the year and half since Northern Virginia Cop Block was founded, we’ve used Virginia’s Freedom of Information Act (FOIA) to discover revealing information about things like cops’ driving records, lawsuits against local law enforcement agencies, politicians colluding to undermine police accountability, and other things. Here’s a sample of some things we found out. In February of 2015, Sharon Bulova, Chairman of the Fairfax County Board of Supervisors announced the formation of a commission to review police policies and practices in the aftermath of the John Geer case, which had involved nearly two years of stonewalling since Geer was shot and killed by Officer Adam Torres. After reviewing official press releases and news reports about the commission, we noticed that information about who would be selected to serve on it and how was pretty thin, and it soon became obvious the membership was heavily weighted with law enforcement. We submitted a FOIA request for the county government officials and employees to see how this happened. The emails received showed that six different politicians in the state legislature contacted county officials to lobby for local police union heads to be appointed to this commission: Delegate Ken Plum, Delegate Marcus Simon, Delegate Scott Surovell, Delegate Tim Hugo, Delegate Kaye Kory, and Delegate David Bulova. These same six politicians had never seen fit to publicly say a damn thing about John Geer’s death or how the county had obstructed justice by refusing to cooperate with the prosecutor’s investigation, resulting in the involvement of the Department of Justice, pointed letters from an Iowa congressman, a lawsuit from Geer’s family, damning media coverage, the first known police brutality protests in the county, and grievous damage to the reputations of both county leadership and the police department. However, these same six previously mute state legislators could not send in their letters of support for killer cop advocacy groups soon enough. It was truly a despicable display that exposed that their loyalty lies firmly with the perpetrators of criminal police abuse and murder, not the victims. The Washington Post ran an article about the emails we received in this FOIA request. If you’ve seen the horrific video of naked, mentally ill Natasha McKenna being manhandled and then repeatedly tased by a hazmat-suited goon squad of deputies, you’ll never forget it. You would think perhaps the terrible memories and guilt from having participated in such an atrocity might lead to (incarceration) pursuing another line of work, but not for these guys. While Sheriff Stacey Kincaid has revealed that they are no longer serving on the response team, a FOIA request for staff titles and salaries revealed that all six deputies are still on the payroll. A FOIA request for lawsuits against the Sheriff’s Department revealed that there is an active lawsuit in the McKenna case, although the records provided do not show the amount sought. The records also show that a number of people have sued for being denied medical care, including two open cases. The only successful lawsuits are from 2014, where one claimant received $33,000 for being incarcerated seven months past his/her release date, and one employment discrimination claim which netted $25,000. 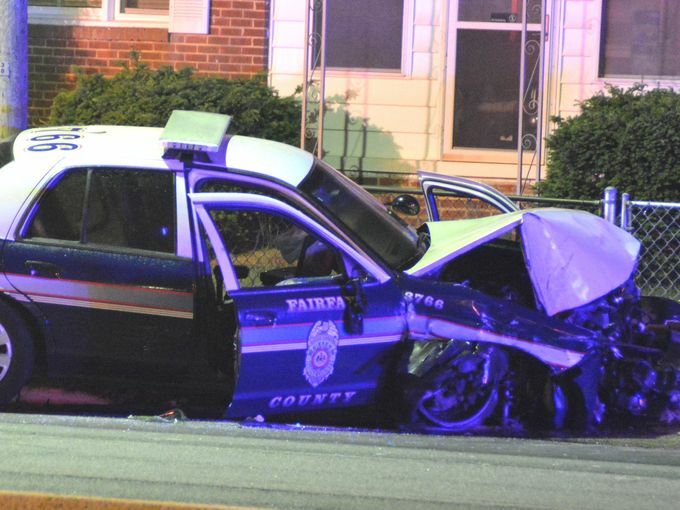 Fairfax County police are notorious for being terrible drivers. First there’s the case of Ashley McIntosh, who was killed when an FCPD officer sped through a red light while not using the siren and crashed into McIntosh’s car as she passed through the intersection. The incident was recorded by a dash cam in the police cruiser. The officer, Amanda Perry, was charged with reckless driving, but was acquitted by the judge in her trial. The county later settled a lawsuit from McIntosh’s family for $1.5 million dollars. A FOIA request for lawsuits filed against the department between 2006 and 2015 showed that the department has paid out an additional $191,000 for at-fault accidents caused by its officers. Fairfax County, which has had 471 at-fault accidents since 2010, says it has paid out more than $1,000,000 in claims related to those crashes. Price emphasizes accountability related to accidents and also includes discipline for the officers involved. Unlike some other jurisdictions we looked at, Fairfax County can and has cited officers for causing crashes. But not all write citations, instead issuing internal discipline ranging from reprimands to suspensions and even termination if warranted. But in Fairfax County, Major Price says the focus is on intensive training to prevent accidents and to learn from them if they happen. The county, he explains, puts a massive effort behind making sure its officers are prepared for scenarios they’ll see on the road, so they can perform safely. 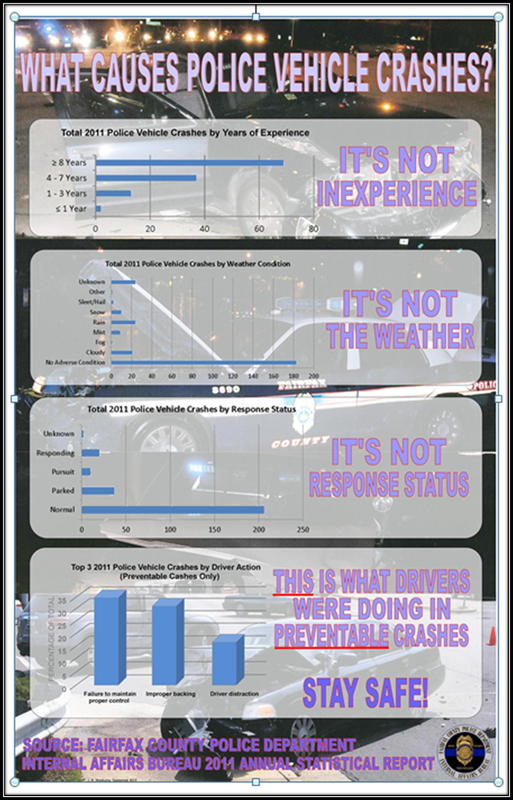 This poster obtained through another FOIA request sheds some additional light on what’s behind all these car crashes. Maybe they can train their officers to stop randomly losing control of their cars under normal driving conditions, and to also stop backing into people.